Info "Driving a stick shift can be kind of sticky, so put a little oomph into it." Sticky Shift is one of Ashley's Microgames in WarioWare: Smooth Moves. The name is a pun on "Stick Shift". 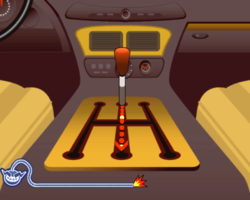 The player has to change gear by following the lighted path on the gearbox. 1st level difficulty: There will be two shifts. 2nd level difficulty: There will be three shifts. 3rd level difficulty: There will be four shifts. This page was last edited on February 19, 2018, at 22:39.